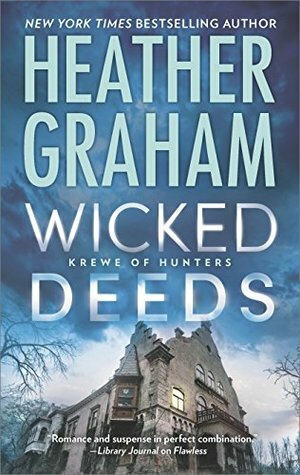 WICKED DEEDS (Krewe of Hunters #23) BY HEATHER GRAHAM – Books, Books and More Books! Eager to start their life together, historian Vickie Preston and Special Agent Griffin Pryce take a detour en route to their new home in Virginia and stop for a visit in Baltimore. But their romantic weekend is interrupted when a popular author is found dead in the basement of an Edgar Allan Poe-themed restaurant. Because of the mysterious circumstances surrounding the corpse, the FBI’s Krewe of Hunters paranormal team is invited to investigate. As more bizarre deaths occur, Vickie and Griffin are drawn into a case that has disturbing echoes of Poe’s great works, bringing the horrors of his fiction to life. All Vickie and Griffin wanted was a little stop on the way to what would now be both of their homes, before Vickie enters the FBI Academy as part of the Krewe of Hunters, a paranormal group inside the FBI. But that isn’t going to happen. When Mr. Poe himself puts in an appearance in Vickie’s dreams and in public, she is drawn in to helping him figure out how he died and who did it! But with bodies turning up badly staged like Poe’s works of fiction, they have more current crimes to figure out. Or are they all tied together in some bizarre way? Always a fan of Graham and especially this paranormal series of characters, this one did not disappoint. Fans of history and fans of Poe will be thrilled with the outcome!